There’s a body in the water - and she’s wearing your clothes… Impulsive and intrepid psychotherapist, Juliet Grey, can’t resist responding to an anonymous text message telling her to go to Hammersmith Bridge at dawn. But it isn’t simply the dead body in the water that disturbs her, it’s the way something uniquely personal to Juliet has been left on the corpse. Another obscure message - another London bridge - and Juliet finds herself caught up with a serial killer, who leaves personal mementos instead of collecting trophies. Teaming up with local detective, DCI Brad Madison, Juliet strives to find out why she has been targeted and how it’s connected to the accident that killed her brother, nineteen years ago. Can Juliet use her knowledge of the human psyche to get inside the mind of the killer, before another body is found under a bridge? And how long before Juliet herself becomes the next target? 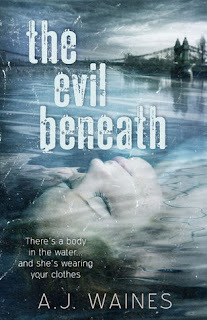 A. J. Waines is a new author for me but after reading The Evil Beneath I will definitely be checking out her other titles. As a fan of murder mysteries and romantic thrillers, The Evil Beneath did not disappoint. It was exciting and tense right from the beginning where Juliet gets a strange text telling her to go to Hammersmith Bridge. After finding a dead body the creepiness didn't end there as she receives more anonymous texts and the body count begins to climb. On top of this, Juliet is seeing patients in her own home which adds to the tension and danger factor. She also has an alcoholic ex-boyfriend who may or may not be connected to the murders. There was a little bit of simmering romance in the background with DCI Brad Madison playing the love interest. However, the romance was kept to a minimum in favour of pace and suspense. Well written and addictive. This is a book I couldn't and wouldn't put down until I got to the end. The Evil Beneath is available in paperback and ebook. On Kindle it is currently priced £1.99 or Free to read with Kindle Unlimited. That sounds like a great read! Thanks for the review.